Covered call writing is a low-risk strategy that allows us to generate monthly cash flow by selling stock options. Since we are obligated to sell our shares to the option buyer (holder), one of the understood possibilities is that we will “lose” our shares at the strike price or the price we have agreed to sell our shares for mid-contract. For most of us, this is not a disadvantage but rather a positive because, if it occurs, we will have maxed our trade results and now have the cash from the sale of the stock to re-invest mid-contract. The chance of “early assignment” (option exercised and shares sold prior to expiration Friday) is extremely rare. When it does occur it is usually related to a dividend distribution. The general rule is that if the ex-dividend date (date we must own the shares to be eligible to earn the dividend) is prior to the expiration date of the option and the time value of the premium is less than the dividend about to be distributed the chance of early exercise is much greater but not guaranteed. 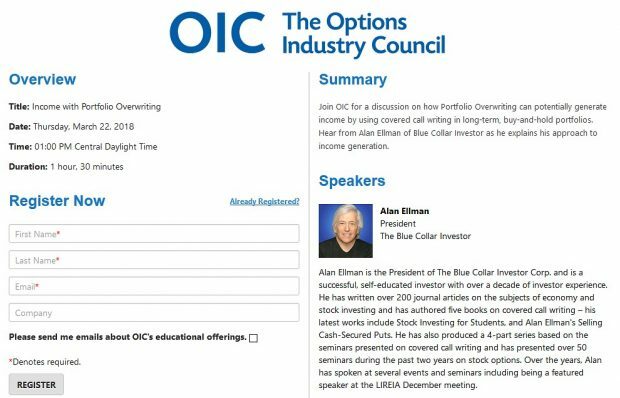 This article is geared to members of our BCI family who use covered call writing in their buy and hold portfolios to generate higher annualized returns but do not want their shares sold. Usually, these portfolios are held in non-sheltered accounts with securities that have a low cost basis and there are tax issue concerns if shares are sold. For some of our members, these shares have been generating monthly dividends that we would like to continue to flow. Let me premise my remarks by saying that we can never guarantee that our shares will not be sold early because retail investors make mistakes. So even if it makes no sense to exercise early, some may, and those exercise notices may randomly end up in our accounts. Likely? No. Possible? Yes. 1- If the ex-date is in the 1st week of a contract, sell the option the day after the ex-date (and still capture 3 weeks of time value). 2- If the ex-date is later in the contract, sell a 2-month option after expiration of the previous contract. When the ex-date is not close to the expiration of the contract, an option holder will rarely exercise early. There are methods we can employ to dramatically decrease any chance of early exercise due to dividend distribution but we can never be 100% certain of avoiding such events because of potential errors made by retail investors (may “spend a dollar to make 50 cents”). I will be in SE Florida for 11 days in early September attending to family real estate business and was invited to speak at a local options club which meets 15 minutes from where I’m staying. As many of you know, I’ve never met a microphone that I didn’t want to speak into when it comes to covered call writing, sooooo…. For the week, the S&P 500 rose by 0.7%, for a year-to-date return of 10%, including dividends. I am a new member and this article is very timely for me because many of my stocks have dividends. Can you explain what you mean by “Time value component of the option premium < the dividend about to be distributed" I hope this question isn't too basic. 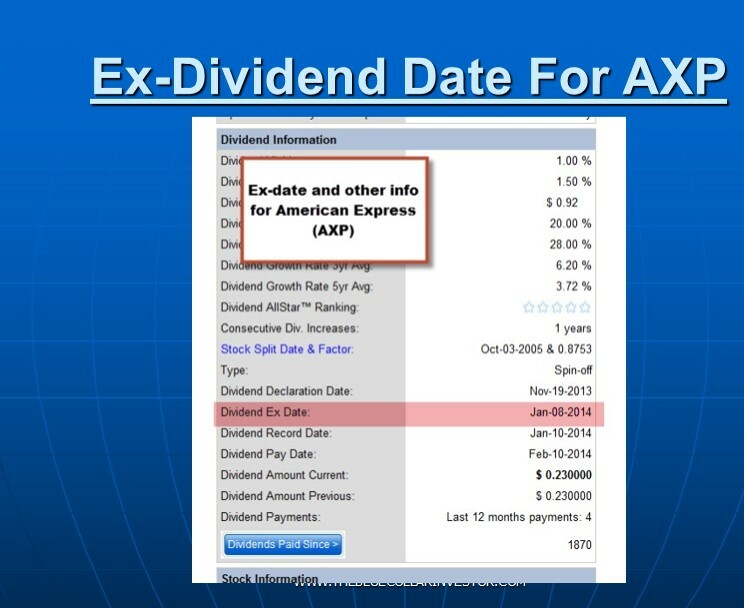 In the above screenshot, the dividend about to be distributed for AXP is $0.23 per share. In an article I was reading about options the term “premium over parity” was used and it confused me. Can you explain in simple terminology. As always, thanks for all your help. The Weekly Report for 08-29-14 has been uploaded to the Premium Member website and is available for download. The Weekly Report has been revised and uploaded. The “Open Interest” column in the previous upload was incomplete. Look for the report “Weekly Report And Watch List 08/29/14-REVA”. How about a variation to covered call writing with the following scenario? i.e. cash-secured selling of a call and put? In this instance, you would have the cash to purchase the stock in the event the stock went up or down. If it went down, it would be a good way to purchase a stock by getting two premiums (in essence, lowering the purchase price of the stock). If it did not, you would be collecting two premiums and both options expiring worthless. 1- When you sell a $30 call how would you know how much cash you would need to secure that position? The holder has the right to buy your shares (which you don’t own yet) @ $30. If share price moves to $35, you would need $3500. If it moved to $70, you would need $7000. Unless you buy the shares first you are not truly “covered” or protected. 2- On the put side you have secured the put position because you enter being willing to buy the stock at a maximum price of the strike – put premium. If the stock price closes below $30 and the premium was $1, you would have effectively purchased the stock @ $29 per share which would result in an unrealized gain or loss depending on the current price of the stock. 3- If you buy the shares for the call position and become truly protected then you are using two very similar strategies and securing each position. You can accomplish the same thing by selling 2 contracts of either the call or the put after deciding which strategy is most appropriate. I will be addressing put-selling in great detail in my next book, coming out soon. Keep those ideas coming…there’s a gem out there someplace. The first strategy is obvious, you sell after the ex-date and you keep selling covered options monthly or bi-monthly knowing that you will not have to worry about dividends until next year. The second strategy is not that obvious to me. 1. When you say ‘later in the contract’ what exactly do you mean? Is it one, two, or three weeks later, or even more? 2. Why a two month option? 3. As you mentioned, some option holders might exercise even if it doesn’t make financial sense. What do you do in that case? 1- “later in the contract” means that if the ex-date if too far into the current contract to generate a time value return that meets our 1-month goal, the ex-date is later in the contract and we must go to Plan B which is to write a 2-month contract rather than wait until the day after the ex-date and use a 1-month contract. 2- We use a 2-month option because early assignment is unlikely when the expiration date is not near te ex-date. It will also minimize our risk of ownership and allow us to avoid upcoming earnings reports. 3- There is no way to plan and avoid a situation when a retail investor makes an investment error and asks for early assignment and then that assignment notice is randomly sent to your broker and then randomly to you. A very long shot but possible and unavoidable. ← Expanded Weekly Options: When Should We Enter A Trade?